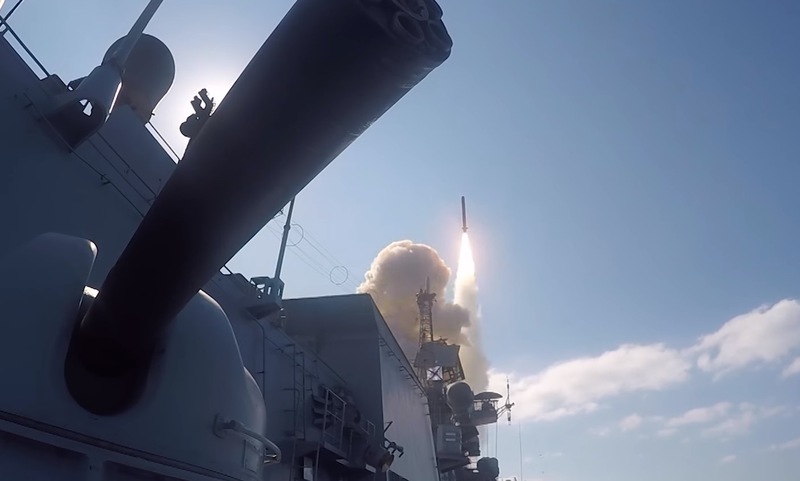 Frigates Admiral Essen and Admiral Grigorovich and Krasnodar submarine have destroyed by Kalibr cruise missiles large depots of armaments and ammunition of the Islamic State terrorists in Syria, Russia’s Defense Ministry said on June 23, TASS reports. "The launches of six Kalibr cruise missiles were carried out from the eastern part of water area of the Mediterranean Sea by frigates Admiral Essen, Admiral Grigorovich and Krasnodar submarine of Russia’s Navy on the targets of the ISIS terrorist group in Syria," the statement said. The massive missile strike destroyed command posts and large depots of armaments and ammunition of the ISIS terrorists near the Akerbat town in the Hama province, where an arsenal of gunmen was blown up after being hit by the Kalibr cruise missile, the ministry said. The ministry stressed that Russia's advanced diesel-electric Krasnodar submarine carried out launches of cruise missiles while submerged. "The remaining gunmen and targets of the ISIS terrorists were destroyed by airstrikes of bombers of Russia’s Aerospace Forces," it said. Russia informed the commands of Turkey and Israel timely about the launches of cruise missiles via channels of communication.